This little 'Hyaku-nin Issho' newsletter has been going now for just over five years. (Not seven years, like the print series itself - I got started a bit later with the word processor work ...) In the early days, it usually came out about eight pages long, and could thus be printed on two sheets of paper folded together. But I gradually found it more and more difficult to get the material to fit properly on two sheets, and shifted to a three-sheet, 12 page format. It has remained that way for the past couple of years. But does this issue feel a little bit 'thin' to you? Yes, it's only eight pages long this time. Don't misunderstand - it's not because I have nothing to write about! It's rather that I am sitting at my desk here on December 17th, about a month later than I should be, and facing the fact that there is absolutely no chance that I can get a 'normal' issue researched, written, translated, typeset, printed and mailed ... in the short time left in this year. The music program in our high school wasn't too bad, but did have a big drawback from my point of view - the main ensemble was a band, not an orchestra. For someone like myself, who wanted to make a career as an orchestral player, this meant that I wasn't getting any experience playing the music that I wanted to play - symphonies by classical composers. So when I found out that there was a 'youth orchestra' in Vancouver, I jumped at the chance to get involved with it. This group had strings, woodwinds, brass and percussion, the same makeup as a 'real' symphony orchestra, although of course playing the less challenging pieces in the repertoire. I passed the audition for entrance, and took my place at the bottom end of the line of flutes. Our home was in a far-flung suburb of the city, and as bus service was non-existent in our area, it was necessary for me to hitch-hike to rehearsals each weekend. Vancouver is far and away the rainiest place in Canada, and I can't easily forget those damp hours spent standing at the entrance to the freeway leading downtown, with my flute under my arm, and my thumb stuck hopefully in the air, waiting for a ride. Coming home was usually a bit easier, as I could frequently get a lift home with my father, who was working as a night club musician during those years. After our orchestra rehearsal was finished, I would head over to whichever club he was working in that night, go in the stage door, and wait for him to finish. If I had had any brains, I would have shown an interest in his kind of music, but I was too proud for that. I was playing 'real' music: Beethoven, etc. He was 'just' playing jazz ... Some years later, when I finally came to my senses and realized that there were other kinds of music on the planet, I regretted these lost opportunities, but at the time, I had no ear for such things. Concerts ... concerts ... and still more concerts ... The orchestra, the school band, a community band I also joined ... When I think back now about all the different pieces of music I played, and all the different places, they all blur together into one wide stream. 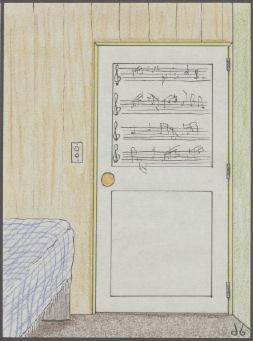 Perhaps the best way to illustrate how crazy I was about music is to look at what I kept on the back of my bedroom door: not a poster of a sports hero or a rock star ... but a number of bars of written music - a long and difficult flute solo from a Ravel orchestral piece. That was my goal. To sit in a major orchestra, and play that beautiful solo. How close would I come ...? As a woodblock printmaker working in an old-fashioned delicate style of carving, I have to be quite careful with my eyes. I keep the workbench well lighted, and avoid eye-strain as much as possible, taking a break anytime that my eyes feel tired. But do you know that my ears too, are very important to my work? Perhaps they are just as important as my eyes! All the time that I sit here on my zabuton, carving away, my ears are filled with the sound of ... my knife blade slicing its way through the hard cherry wood. Have you ever heard such a sound? One has to listen very carefully to catch it! By listening carefully to this delicate sound, I can tell if my knife has been sharpened well or not. If I have done a good job with my shiageto, the sound is barely audible, just a faint trace as the knife passes along the lines of the hanshita. But if I have been careless during the sharpening, the knife then tears the wood a little bit, and my ears tell me at once that something is wrong. I cannot see the difference between a well-sharpened knife and a poorly-sharpened one. But my ears can tell the difference. So I have to be careful, not only of my eye-sight, but of my hearing as well. I guess it's a good thing that my days of playing in a rock and roll band back in my twenties didn't last very long! About a year ago, I had occasion to take part in an awards ceremony being held to make presentations to the winners of various prizes in a national essay contest. Previous to this, my experience of such affairs had been limited to the small graduation ceremony given by my daughters' day care center, a considerably less rigorous event. This ceremony though, was quite an important one, and the awardees represented a complete cross-section of Japanese society, from very young elementary students up through adults, and also including a group of foreigners. Over the course of the afternoon, during the two-hour rehearsal and then the only slightly shorter ceremony itself, I was particularly surprised by the considerable trouble almost all the participants had with some of the formalities involved - most notably the proper bowing techniques. I watched all of these people, one-by-one, step up onto the stage and struggle with what to do. The ideal form was apparently for the presenter and the awardee to first bow together, for the person to then step forward, be presented with the certificate, bowing as he received it, and finally to step back a pace and bow in unison once more before leaving the stage. Almost nobody got it right. In some cases the presenter would bow quite deeply but the recipient would simply nod his head. This person would then realize his mistake and make a hasty deeper bow. This would be picked up by the presenter, who would bob down again in response, usually just as the other person was coming up. Finally they would come to rest, the presentation would be made, and the 'bobbing ducks' routine would begin again. Just when to start the bow? How far down to go? What to do with your hands? Nobody seemed to have any idea about what to do. And these were the Japanese! It was like watching a group of foreigners trying to wrestle with the customs of a strange society. I very much wanted to do a 'good' job, so as my turn approached, I watched the presenter very carefully and tried to memorize the timing of his bowing movements. But just as I walked towards the stage to receive my award, I saw that the presenter was being replaced by a different person for the foreigner's group! And sure enough, my preparation had been useless, for this person followed a different rhythm, and I too ended up bobbing up and down, trying to catch his movements ... And for the presentation, I made another mistake here too. I took the proffered certificate and said in a loud clear voice "Arigato gozaimasu." (I guess my mother's training was long and hard all those years ago ...) When I got back to my seat, my neighbour gently reminded me that it wasn't customary to say 'thank you' on such occasions. Silent acceptance was preferred. Sigh ... And I had so much wanted to show everybody that a foreigner could do the job just as well as a native Japanese. Many westerners who come to Japan either to live, or just for business, have considerable problems with bowing, and I don't just mean the mechanics of 'what to do'. They have real problems with partaking in a ritual that in their minds seems to place them in such a subservient role. It is truly distasteful for them to bow down before somebody. I visited this country on business a number of years ago, together with the owner of the Canadian company for which I then worked, a 'straight-ahead, shake hands, look 'em right in the eye' kind of man. He simply could not bow to our hosts, and I'm sure he felt quite some distaste at my attempts to respond in kind to the Japanese bowing. In his mind, 'real men' stand straight up, and 'weak toadies' bow and scrape. Those with more experience of Japan, realize that it is far from uncommon that the senior of the people involved may be the one who is bowing the deepest, and that 'subservience' is just not a factor in the thinking involved. Of course, 'rank' and status is involved, quite deeply, and people with much experience in the art of bowing are capable of making quite extraordinary calculations as to the proper depth and timing of the bow. But I suppose such sensitivity will soon be something of a lost art. There are not many younger people nowadays who have the inclination to follow such delicate nuances of the custom, and as I found during that ceremony I attended, current standards are very low indeed. That seems somewhat of a pity to me, because the few people during the ceremony who did perform such duties well, gave every appearance of polished poise and politeness. They were not like robots, mechanically going through a memorized sequence of movements, but rather came across as confident, courteous individuals. I felt envious of their abilities, and secretly decided that next time I find myself in this situation, I'll be ready to handle it. I'll practice hard, and become the perfect model of correct bowing. There's only one problem. When am I going to get another award? When I look in the mirror in the mornings these days, the face that I see staring back at me is that of an increasingly 'elderly' man. The white hairs in my beard now far outnumber the dark ones, and the lines get deeper and deeper ... Recently I feel very much older, and this is a feeling that I can't really say I ever felt much before this year. It makes me quite curious: in three more years, when this project is all over, and I compare two photographs - the 37-year old David as he started, and the 47-year old David as he is finishing - will there really be only 10 years of difference? The way I feel at the moment, I suspect that the difference will be more like 20 years! Thank you all very much for your continued support of my endeavours. Seventy down, thirty to go!